When should you use diaphragm seals? 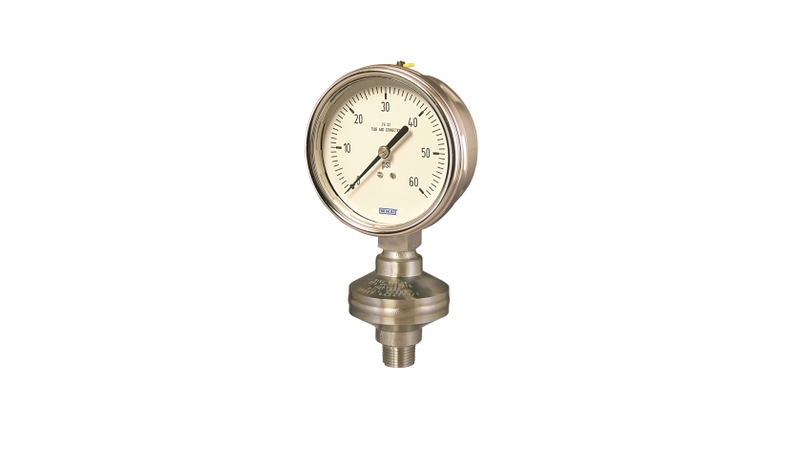 Pressure gauges are often used in extreme conditions in industrial processes, and some gauges are specifically designed for use in these difficult process environments. These tough process gauges typically include features such as hardened housings, liquid-filled casings, and a stress-reducing Bourdon tube design. hey are often equipped with a diaphragm seal to prevent contact between the hot or corrosive media and the gauge itself. A diaphragm seal protects pressure gauges from dangerously hot, viscous, or corrosive media and dramatically extends the lifetime of the instrument. A diaphragm seal is connected to a gauge as either a direct connection or by way of a capillary. An elastomer or flexible metal diaphragm keeps the process media from contacting the workings of the gauge. The chamber between the diaphragm and the gauge is filled with a fluid that accurately transfers the pressure of the process media by hydraulic means. Any change in process media pressure is transmitted through the flexible diaphragm into the system fill fluid, which then connects to the Bourdon tube of the gauge. Diaphragm seals can be easily mounted onto gauges using threaded, flanged, in line, sanitary, or other types of connections. In most cases, diaphragm seal bodies and the diaphragms themselves are stainless steel, but instrument industry leaders like WIKA also produce diaphragm seals from other materials including carbon steel and Hastelloy® C-276 for specific applications. WIKA’s diaphragm seals are designed to operate in pressure applications from 10″ Hg to 20,000 psi and at media temperatures between -130°F and +752°F. Diaphragm seals are also installed on pressure transmitters and switches exposed to extreme conditions. High-temperature media – A diaphragm can be designed to include a cooling element; for example, a diaphragm seal with an 8″ cooling tower can tolerate temperatures up to 750°F. Corrosive media – WIKA can provide diaphragm seals made of a variety of custom alloys, including PTFE, gold and silver, or carbon steel. WIKA’s Metal Bonded Diaphragms are designed for processes requiring Hastelloy®, Monel® and Tantalum flush diaphragms. Viscous or crystallizing media – Using pressure seals reduces the number of connections in a process, minimizing internal cavities where clogs typically form. Media with suspended solids – Diaphragm seals minimize clogging in process applications such as pharmaceutical, pulp and paper, food and beverage, chemical, and waste water. When overpressure protection is required – WIKA has designed a diaphragm seal with a continuous-duty contoured diaphragm bed for robust overpressure protection. When sanitary cleanliness is required – WIKA’s patented InLine Seal™ makes sure that your process system does not develop “dead spaces” that encourage bacterial growth. Highly toxic or dangerous media – An all-welded process gauge and diaphragm seal system offers extra protection to minimize the chance of any toxic media escaping. Top quality WIKA diaphragm seals specifically designed around your processes can dramatically extend the lifetime of your pressure measurement instrumentation and lead to significant cost savings. Contact us to learn more about how a small investment in the right diaphragm seals pays off over the long run.